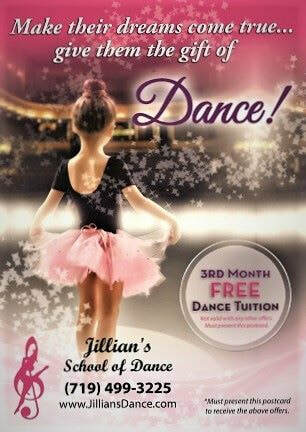 Jillian's School of Dance caters to all ages from 2 years old to Adults with a wide variety of dance styles with smaller class sizes in a non-competitive family oriented environment. Just click on the image to the right and you will be redirect to details and a download tab to print the image. Write the students full name and the date on the back of the printout and bring to the studio office your first week of class to receive a Free Month of Dance. ﻿Please explore our site and the above Tabs to learn more about our studio. If you have any questions, feel free to ﻿Contact Us any time.